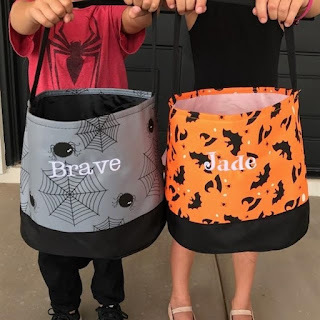 Right now these Personalized Trick or Treat Buckets $13.99 (Retail $25). You will love our adorable TriCk-oR-trEaT buckets! Ready to be personalized with the names of your favorite goblins. Choose from our favorite fonts, thread colors and 16 super fun designs. Collapsible for easy storage and sturdy enough to use year after year! $2.99 for the first item and $1.50 for each additional item. US only. Ships no later than Mon, Oct 1.